Includes: Activity and Discussion Guide. A Documentary about the unique challenges facing Gay and Lesbian seniors. 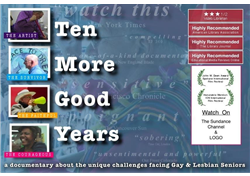 The candid stories of several LGBT elders poignantly personify the struggles and concerns of many in the LGBT community as they get older in a society that is not ready (or often not willing) to meet their needs for well-being and quality. Both an engaging history and a beacon of hope, this award-winning films gives voice to the LGBT community–and that voice speaks loud and clear–from the trangendered activist Miss Mary to the pioneering artist James Bidgood. With insights on national policies on aging, and input from professionals in the fields of aging, social services, and law, this contemporary bird’s-eye view of the LGBT community will increase understanding of the issues LGBT elders face, while underscoring the continued need for public advocacy and education.